We don’t write about every iPhone application that we come across (there are other sites doing a great job at that), but sometimes we just have to. 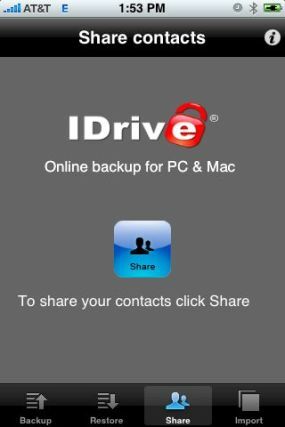 For instance, IDrive, which specializes in backup solutions, has a neat application dubbed IDrive Lite that allows you to backup, share and restore all your iPhone contacts completely free of charge if you’ve updated your iPhone software to 2.0. Especially for business users, tools like this can come in quite handy. Once the app is installed on your iPhone, you can tap the ‘Backup’ button and the tool will automatically save your contact information to ‘the cloud’ i.e. IDrive servers. No signups required. You can easily restore contacts as well without overwriting people you’ve added after your last backup. Finally, the sharing functionality is rather nice; it lets you share information with other contacts in your address book by sending them an SMS with an import key for them to use. Update: as someone points out in the comments, you can only restore your full contact list and not individual ones. I’m also hearing reports that the app crashes the device but I haven’t had any problems. MobileMe does much of the same (not for free though) but other than that we haven’t found any other application in the App Store that can do what IDrive Lite does, unless we’ve missed those, and we should also note Tapulous has this app called FriendBook which lets you manage and swap contacts with other iPhone users. Update: other backup solutions for the iPhone are Funambol and My.Memova. Pro Softnet Corp, the company behind IDrive, is currently working on making it possible for iPhone owners to backup and share photos as well. For now, you can download the contact backup solution from the App Store here.